Hello! Welcome to the Taylored Expressions February Release Day! 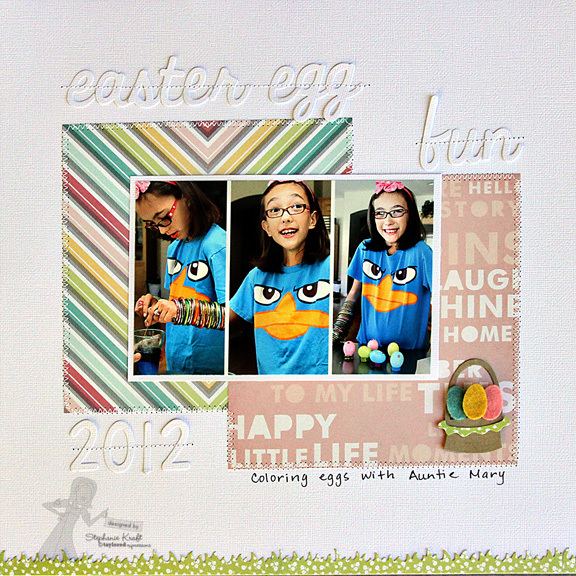 This is our Easter release, and I know you are going to love all of the new stamps and dies! All of the products that we have been peeking the last couple of days are now available in the TE store in the Fresh Out of the Oven Department! Today I am featuring the new Whimsy Alpha! I made a 12x12 layout and included some photos of Sabrina coloring Easter eggs last year. I also used the new Whimsy #'s to create the year, 2012. I used a few other previously released Taylored Dies on my layout: the Grass Border along the bottom and the A Tisket A Tasket to create my basket and eggs. Accessories: Taylored Dies: Whimsy Alpha, Whimsy #'s, A Tisket A Tasket, Grass Border Die; Taylored Felt: Cotton Candy, Robin’s Egg, Sunflower (Taylored Expressions), Foam tape, Thread, Sewing machine. Hi Stephanie! I always really love your scrapbook pages! This is so fun - and the use of the letters is perfect. Great project! Stephanie! Another perfect scrapbook page! You are the master! Perfect use of the new alpha/number dies. Really nice. Oh this is Soo Sweet Stephanie!! Love your Awesome Layout and what Super pics of Sabrina!! Just Darling!